Vira Yakymchuk is a primarily self-taught artist born in 1990 in Husyatyn, an urban-type settlement in the Ternopil Oblast, a western province of Ukraine. Her figurative paintings are very oneiric, one could easily think that they are surreal, but in fact it is her way to explain a most hidden side of reality through sensations, thoughts, emotions and dreams. Natural motives are also very present in her art as a representation of freedom in time and space, the perfect way for self-discovering and communication between us and with our natural environment, and everything with the purpose of showing us which we have become unable to see as the only way to achieve a social change. What does the artistic creation mean to you? I am an artist, and I love to stay in tune with my creative side. To me art is any work resulting from the reprocessing of perception, sensation and emotion into something having a relationship of symbolic resonance with the original inspiration. In the end art is probably whatever you make in that sense. We can express our feelings by regarding the world around us either by poetic or by descriptive meanings. Art is something beautiful in thought, expression, and also for the sight. You are a completely self-taught artist. When and how did you feel that painting was your way in life? So, I consider myself an absolute self-taught artist because I started with oil paints in 2010 and I felt it as a different world. At that time I studied at The Ukranian Catholic University, the "Art of Icon" programm about traditional paintings and two years later a painter from Turkey showed me the real world of figurative art. He inspired me and I started to work more, as it was my dream that turned into a reality. But everything around art had always been my dream. The first time I realized it was when I was 5 years old when I went to a church with my grandmother. I found there my paradise of painted walls and that was how I began to love art. You describe your art as classic presented in a contemporary way. Could you expand this description? I have worked this art style not so long. Gradually I go forward to show my art a classic but presented in a modern way. That means techniques, sensations, images, ideas, concepts, thoughts, emotions and feelings that reflect objective reality experiences, where nature allows us to give up time and space. What are your artistic influences or references? That Turkish artist that I mentioned before, that I was lucky to find. For me seeing his paintings is something extraordinary. Each time I look at his works I have the feeling that I am stepping alongside him into a moment frozen in time. He shows me the artistic world through his eyes. But now my references are people, nature, art, literature, music, dance and life. They are all are very important for me, as they always have been since I was younger. I'm a self-taught painter and I spend a lot of time seeking out diverse sources of inspiration. 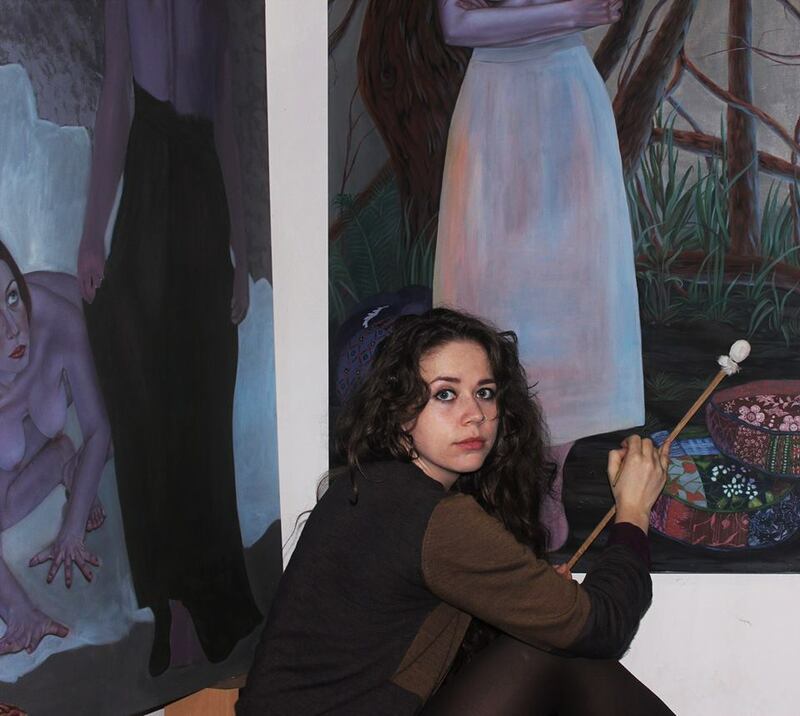 Your work is always figurative featuring mainly human bodies and nature elements. How important is nature in your vision of existence? 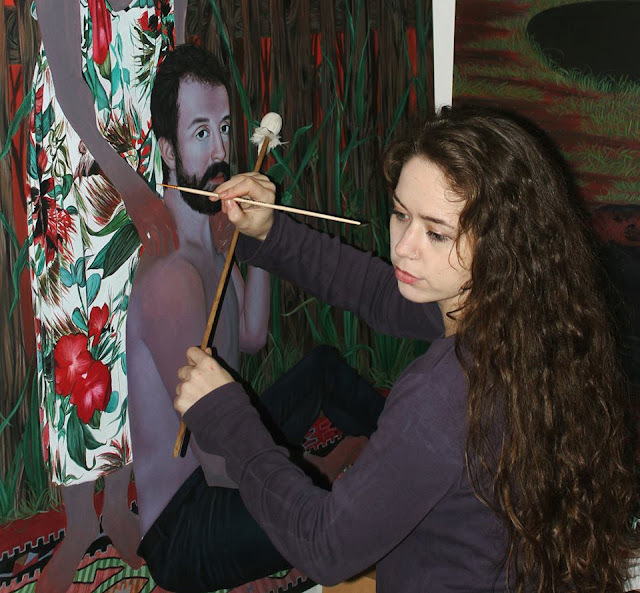 Yes, my work is always figurative and features mainly human bodies and nature elements. I love the human body, feelings, emotions... that is beauty. I also use some pieces and materials to indicate that we live right now. We constantly need to remind how important is nature for each of us. To understand this, you just need to look around to realize that importance, but unfortunately we quickly forget it. Nature is our natural source of existence. It is not just a source of wealth, but also a source of spiritual wealth. Without mentioning the aesthetic pleasure we can find in nature. Man gets pleasure from watching the sun, the forest, one can see beautiful mountains and dense forests, blue seas and yellow sands. This invaluable beauty that nothing else can surpass. Do you have a spiritual sense of existence? Yes, I have an spiritual sense of existence and it is nothing else than the love that surrounds us. We always strive to unravel the secret of our happiness, to know the beauty and the greatness of our soul. And our whole being constantly reaches for something higher, and the unknown secret that would have fed our tired body and soul. Following the inclinations of our nature you get often immersed in the world of positive feelings of delight and pleasure. And so gradually these searches lead us to the world of eternal goodness, the world of love. Only love make a human a real human and nature gives us everything to feel it. My spirituality is a creative focus, excitement, a certain type of outlook, a relation with the absolute, to the world of nature, society, other people, or with myself. To proceed from seeing a human as a spiritual being means that we determine our absolute right to spiritual experience; to perceive our own life as a real entity on its own, and responsible of its implementation. The purpose of spirituality is to achieve harmony between our lives and the world and leads forward towards some form of emotional and intuitive development, and to the vitality of its internal strength. Do you think that we have lost our connection with nature? I grew up in a Ukrainian village, surrounded by trees, flowers and animals of various species. Nature has always played an important role in my life, inspiration and creativity. I share the beauty and simplicity of the world as I see it myself. In my works I want to reflect the inner world of any physical structure - the spiritual world of objects, landscapes and people. Sometimes the idea of ​​following picture ripen within a few months. There are strings that connect different areas and layers of our lives. I am bound by such threads of his job. I find them everywhere. My art - it is the desire to express themselves and show me what I feel about the world in which I live. Everything I do - it is the result of waves that resonate with my soul. It - wave influence, knowledge, emotions and experiences that are reflected in the works. My paintings - part of me. My creativity - this is my way of saying to the world: "hope gives you wings and courage." And what have we lost with that disconnection? I don't know, what we are lost with that disconnection... because of this we can find a lot of answers, but sometimes there are more questions. It is true that one can easily feel a dreamy atmosphere in the scenes you paint. Where is the boundary between dream and reality for you? I can easily feel a dreamy atmosphere in the scenes, when I paint, when I am relaxed, when I sleep. Most often it is a combination of imagination, the unconscious and repressed the place where awareness and dream are intertwined, where strange things appear and suggest the existence of a hidden peace, in all of us. Where the balance of illusion or dream and reality is in equality, there arises a peace that brings us to peace. At image of life, by contrast, excludes it, or else sees in it a unique potential for the affirmation of life. I've always been inspired by dreams, secrets, mysteriousness, nature it's a state of mind and the transformation of desire. Several of your works are selfportraits or scenes that are defined around you. What does your art show you about yourself? Painting is a way of representing " what I am " when I paint selfportrait, the way I react to what goes on around me, but also how I think of the past and the future. To paint is to reflect, to collect feelings, memories and to see what further insights I may glean from them. I try to treasure the small things is life case that's what life mostly is about my faith, my family, my freedom. You speak about a thirst of a social change. What kind of change are you thinking? Is it also a personal change? Through my work, I seek to reveal the invisible to the eyes of the indifferent person: the need and thirst for a social change. But life does not believe in the materialism, capitalism. It is good that it does not believe in it, otherwise the whole world would be a great cemetery. So, this nature that awakens our souls to the vast inner freedom, allows us to give up time and space. The love a make to dream, then can grow within the soul to become the supreme factor which determines the meaning of a person's life. My purpose is to make whoever sees my painting aware of his need to love and to give his love, and aware that beauty is summoning us. After all, a person's ability to see around him, makes perfect peace in his soul and a sense of oneness with nature, helps to understand himself and others better. So, a personal my thoughts changing everyday. Could you explain me a sleepy dream? The equation of dream and reality plays an important philosophical role in Taoism in which life should be treated as a dream, but to dream should also be treated as a reality. I think it is the philosophy of sleeping dreams, which in our time help to realize the vision, understand myself and even my lives, to find the truth in a never-ending stream of images and symbols. Very often I feel melancholy, fatigue, stress, falling in love, sadness, sorrow, and often it is the human condition, reflecting the mental anguish, cause drowsiness or, conversely, insomnia. In this case, the dream becomes a kind of necessity, the need of the soul, in a dream I am to philosophizing, looking for answers, I see the reasons for his state and at the same time become more sensitive to everything that happens around me. So, sleeping dreams are often the most filling, which helps me to live, feel and develop my vision, and hence strengthen my philosophy.